I shared this particular photo already, because I simply love it so much. 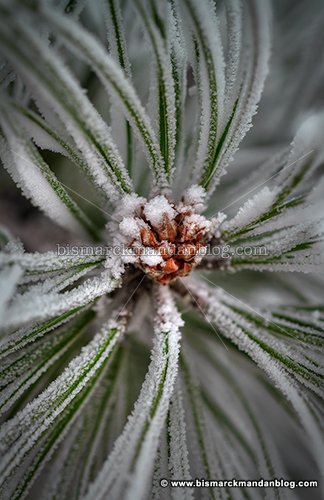 But last Monday I found lots of cool pine trees, each with its own special frosty coating. Long needles, short needles…conifers are simply at their best when the frost comes along. Green needles, brown stem-like branches, and a white dusting. Lovely. White lines. There. I made my music reference for the day. Technically these needles are leaves, so when winter strips the cottonwoods et al of their broad leaves, we’ve still got plenty of these pointy leaves to photograph. Fuzzy needles. Do you know the difference between a spruce, pine, or fir? These shapes are the key. I thought they were all the same, but (as a geek) I decided to read up on it. Doesn’t this look like a damsel of some sort? That’s the vibe I got. 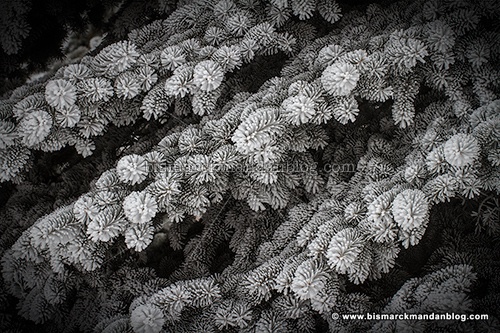 The shapes formed by the branches of these trees really start to become apparent once they’re frosty. 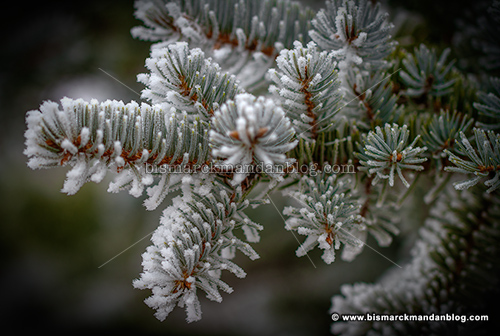 I thought these long-needled branches were my favorite, but then I saw some of the cooler formations of shorter needles and realized that they’re all beautiful. This isn’t a conifer, but it sure is pretty. These flat fronds were tipped with white. 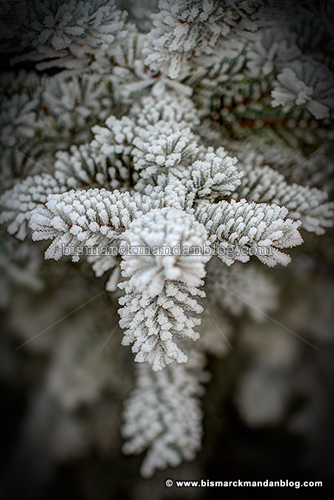 I tend to see things through the lens of my Christian faith, so it makes perfect sense that I would see a cross in this branch, at least from the angle at which I noticed and snapped this photo. These are particularly bushy. For some reason they remind me of Linus, although I can’t put a finger on exactly why. Okay…we’ve covered Day One of the frost last week. Day Two is unique in that it was both frosty and sunny! I had two new lenses, new polarizer filters, and an hour to wield them. I think you’ll be pleased when you see the results in an upcoming post.